A brightly colored smiling sun greets you and butterflies and a snail wander among the flowers. 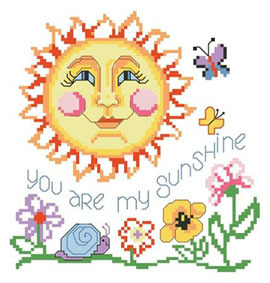 This is such a cheery design, you can’t help buy smile as brightly as the Sun when you see it hanging in a sunny room. Contents: Stitch Count 83w X 87h Finished size on 14ct: 6" x 6"